GM North America chief Mark Reuss: The ATS was developed "to meet or beat the absolute best compact luxury cars in every measure" and represents "the new soul of Cadillac." DETROIT -- Cadillac introduced the new ATS sports sedan as a rival in the U.S. market to the best European small luxury cars and a step toward transforming the 110-year-old brand into a global powerhouse. The ATS is Cadillac's first small car in the U.S. market since the Cimarron in the 1980s. While the Cimarron flopped, General Motors Co. executives see the ATS as a formidable rival for the BMW 3 series -- the best-selling luxury sedan in the United States and the world -- as well as the Audi A4 and Mercedes C class. The car debuts at the auto show here this week after an unveiling by GM's top executives on Sunday evening. The ATS goes on sale in late summer in the U.S. GM has longer-range plans to sell the ATS in Europe, but no timeline has been set. GM North America President Mark Reuss said the ATS was developed "to meet or beat the absolute best compact luxury cars in every measure" and said it represents "the new soul of Cadillac." Reuss said that's why GM built the sedan on an all-new vehicle platform. He said GM could have developed it on the same platform as the existing CTS, which is also rear-drive, or from another vehicle architecture in GM's stable. "But such a vehicle would never become the car to finally challenge the German cars at their own game and win," Reuss said. "This one, however, is that vehicle." That Cadillac's most critical launch in years is a small car might seem ironic for a brand best known historically for hulking sedans. But GM believes compacts have emerged as the most important segment in the global luxury market, in part because of their role as an entry point for younger consumers. "All the luxury automakers are going for that piece of the pie because that's where the volume is," says Jim Hall, principal of consultancy 2953 Analytics Inc. in suburban Detroit. "Cadillac has got to be there." Cadillac -- once the top-selling luxury brand in the U.S. market -- has been surpassed since the late 1990s by European rivals BMW and Mercedes, and Toyota Motor Corp.'s Lexus division. In some cases, GM's flagship brand has been late to enter hot product segments such as SUVs or crossovers, or failed to gain traction with models such as the Catera or XLR roadster. GM's financial woes have also forced Cadillac to pare its lineup and in some cases, delay products. 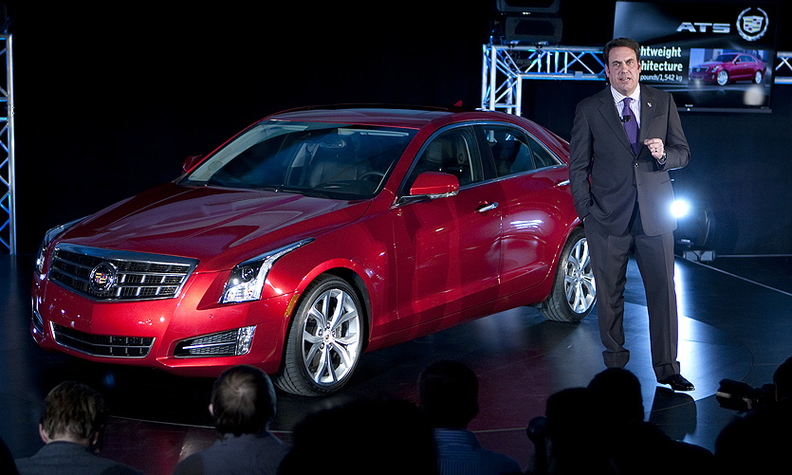 The ATS will be slotted below the mid-sized CTS sedan, the brand's top-selling car. Hall says the ATS has a chance to eventually surpass the CTS as Cadillac's volume leader. In November, GM CEO Dan Akerson said the ATS, along with the recently unveiled XTS large sedan that goes on sale in the United States in late spring, will spearhead the expansion of Cadillac sales in overseas markets. He said GM will sell both cars in China and eventually produce them there, although he didn't say when. The ATS' exterior design continues Cadillac's so-called art-and-science theme of angular lines and crisp edges, with narrow, swept-back LED headlights and plenty of creases. It's nearly 4 inches longer than the 3-series sedan, with a wide stance. The interior, which features carbon-fiber and wood trim, will offer Cadillac's new technology interface that features an 8-inch LCD touch screen that lets the user flip through displays much as on a smartphone. The ATS will be built at a GM plant in Lansing, Michigan, alongside the CTS coupe, sedan and wagon. Industry sources have said GM eventually will build an ATS coupe and possibly a convertible. IHS Automotive forecasts ATS sales of 15,000 units in the United States this year and 60,000 in 2013, including 3,500 coupes. It projects sales of 72,000 in 2014, including some convertibles. Last year, U.S. sales of the BMW 3 series totaled 94,371, down 7 percent. A redesigned 3 series also will be shown at the Detroit show and goes on sale next month as a 2013 model. The ATS will be the first GM vehicle to get a new 2.0-liter turbocharged four-cylinder engine that puts out 270 hp and 260 pounds-feet of torque. GM plans to roll the engine out to other models, too. Reuss said a diesel engine will also be offered during the ATS' first product cycle. Other engines include the 3.6-liter V-6 used on the CTS and the SRX, which will be sold only in North America, and 2.5-liter naturally aspirated four-cylinder. They'll be combined with six-speed automatic and manual transmissions. All-wheel drive will be optional. At about 3,400 pounds (1550 kg), the ATS' curb weight is lighter than some key rivals', including the Audi A4's 3,505 pounds and the Mercedes C series' 3,560 pounds. The BMW 3 series weighs 3,362 pounds. GM says fuel economy will top 30 U.S. mpg (7.8 liters/100km). An aluminum hood and natural-fiber door-trim panels help trim the ATS' weight, improving the car's fuel economy and making it more nimble. The ATS should help reinvigorate Cadillac sales, which lost momentum last year after a strong comeback in 2010 that made it the United States' fastest-growing luxury brand. Cadillac's sales rose 4 percent in 2011 while industry volumes advanced 10 percent. The slowdown stemmed mostly from a dearth of products. GM phased out the DTS and STS sedans last year to make way for the XTS. That left Cadillac with just three vehicles: the CTS, SRX crossover and Escalade SUV. In addition to the ATS and XTS, Cadillac plans to introduce another new car, the ELR, a plug-in hybrid based on the Chevrolet Volt. Carl Sewell, whose Sewell Automotive Cos. in Texas owns four Cadillac stores, said the ATS should bring younger buyers into the showroom. Said Sewell: "For us to have a true entry into the largest market segment in the luxury field with the ATS is so exciting for Cadillac dealers."